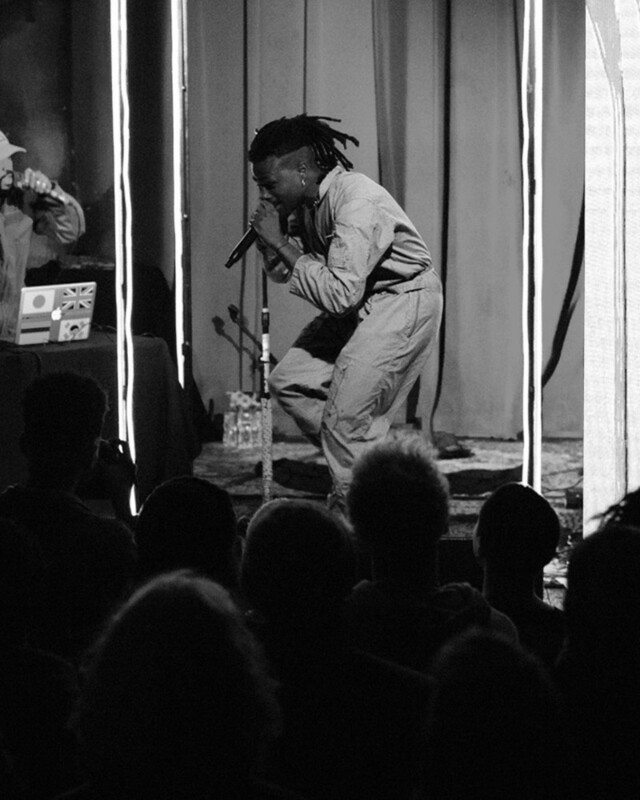 Watch Duckwrth Perform “I’m Dead” from Trocadero Theatre in Philadelphia. The historic Trocadero Theater has housed many iconic acts in its near 150 year lifetime. There is a definite “if these walls could talk” vibe as soon as you enter the box office. The empty theater is like walking into a scary movie scene and the balconies seem to be where all the ghosts would hide. But the secondary upstair stage fittingly called the balcony was full of life as Duckwrth and team took the stage. The stage was too small to hold the act in a literal sense. Duckwrth’s stage set up is elaborate for someone on their first headlining tour. Two brightly iridescent LED screens set symmetrically on stage surrounded a 3 dimensional neon box that Duckwrth lived in for the set (mainly because there wasn’t room to leave the box). DJ Anthony Dragons, who added amazing comedic banter throughout the set, and bassist Aneesa Strings, whose backing vocals and thumping basslines were a perfect compliment throughout the night, were nearly hidden if you weren’t at the right angle. That didn’t stop Duckwrth from putting on a spectacularly energetic performance. You could tell he felt confined, as though he might kick a wall down to make more room for himself, but it added to the frenetic energy of his set. They were taking fans on a trip down memory lane to his first release, Nowhere, by the second song almost to test the crowd’s knowledge and they passed with flying colors. Every joint Duck picked from his catalogue was complimented with clips from the music video or a correlating color scheme on the screens, and further blessed by the crowd chorus singing every word. The audience felt as though they were up on something the rest of the world will end up late to. Packed in tightly, with nary a bad standing room only spot in the house, it’s the type of show that feels uncomfortable to photograph because you know you’re taking away from someone’s experience every time you tap a shoulder to squeeze by. Duckwrth is the truth, and is one big song away from being a household name. Everyone in the audience was well aware, and I’m sure they also knew this was the last time they’d have the opportunity of seeing an idea this big trapped on a stage this small. Kweku Collins performs in New York City.